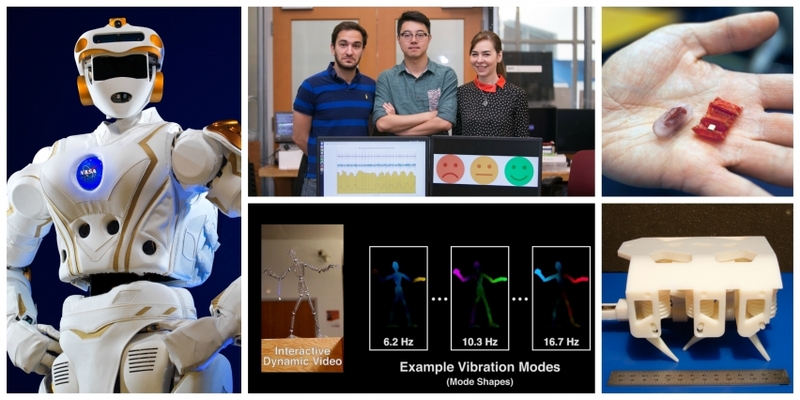 Machines that predict the future, robots that patch wounds and wireless emotion-detectors are just a few of the exciting projects that came out of MIT’s Computer Science and Artificial Intelligence Laboratory (CSAIL) this year. Here’s a sampling of 16 highlights from 2016 that span the many computer science disciplines that make up CSAIL. A team led by CSAIL director Daniela Rus developed an ingestible origami robot that unfolds in the stomach to patch wounds and remove swallowed batteries. Researchers are working on NASA’s humanoid robot, “Valkyrie,” who will be programmed for trips into outer space and to autonomously perform tasks. A 3-D printed robot was made of both solids and liquids and printed in one single step, with no assembly required. CSAIL hosted a cyber summit that convened members of academia, industry, and government, including featured speakers Admiral Michael Rogers, director of the National Security Agency; and Andrew McCabe, deputy director of the Federal Bureau of Investigation. Researchers came up with a system for staying anonymous online that uses less bandwidth to transfer large files between anonymous users. A deep-learning system called AI2 was shown to be able to predict 85 percent of cyberattacks with the help of some human input. A new imaging technique called Interactive Dynamic Video lets you reach in and “touch” objects in videos using a normal camera. Researchers from CSAIL and Israel’s Weizmann Institute of Science produced a movie display called Cinema 3D that uses special lenses and mirrors to allow viewers to watch 3-D movies in a theater without having to wear those clunky 3-D glasses. A group from MIT and Harvard University developed an algorithm that may help astronomers produce the first image of a black hole, stitching together telescope data to essentially turn the planet into one large telescope dish. A team produced a robot that can help schedule and assign tasks by learning from humans, in fields like medicine and the military. Researchers came up with an algorithm for identifying organs in fetal MRI scans to extensively evaluate prenatal health. A wireless device called EQ-Radio can tell if you’re excited, happy, angry, or sad, by measuring breathing and heart rhythms. A system called “Polaris” was found to load web pages 34 percent faster by decreasing network trips. A team analyzed ant-colony behavior to create better algorithms for network communication, for applications such as social networks and collective decision-making among robot swarms. Researchers trained neural networks to explain themselves by providing rationales for their decisions.